I started off the month on vacation so I took advantage of the time to get a couple of long bike rides in and then a few rest days as I started my marathon training for both Philadelphia and the Dopey Challenge in the middle of the month. It seems a little strange to drop my mileage back a bit as I have a pretty good base (typically run 10 or more each long run every week) but I’m sticking to the plan so I don’t overtrain. There are alot of miles to cover between now and January and I’ll be training 5-6 days a week for 6 months so maybe lighter is better for now. The training seems to have started out well. I’m experimenting with my run/walk ratios right now as I returned to using Jeff Galloway’s method to get me through my two big goals injury free. 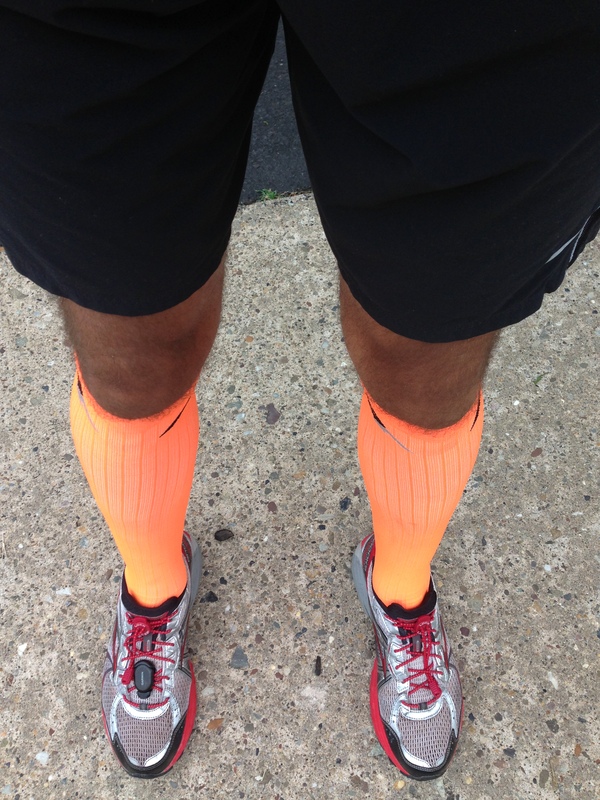 I’m also trying out alternative fuels (Accel and PowerBar) and some new gear (Pro Compression Marathon Socks). I’ve a good few runs ahead of me to get it right but I’m pretty much set on all my other gear. It is nice to try new things from time to time. I still have yet to start my core work on the new stability ball. It’s staring at me from the corner of the room and making me feel guilty. If I start working on this in August this should be plenty of time to start seeing the benefits. I’m coming up to my 3rd ‘Runniversary’ soon so I have a special post lined up for that. I was able to complete the workouts on schedule this week. Cross trained on Monday and completed my runs according to schedule. I didn’t get as much sleep as I would have liked this week (weather alerts and thunderstroms at 2am and a 3 year old getting new molars) so I was pretty tired all week. I took both the Tuesday and Wednesday runs easy as I was focused on running a ‘Magic Mile’ as part of my 3 mile run on Thursday. The Magic Mile Time Trial is part of Jeff Galloway’s training method and is used as a predictor for determining your training and race pace. I headed to the track at Council Rock High School South early Thursday before work and did a mile warm up, a mile flat out and a mile cool down. I ran a 6:34 split for my time trial. Although it was 20 seconds slower than the same time last year I am completely okay with that. I’d be more concerned if I was closer to 7 minutes. Here is the link to the workout. Using Jeff’s time trail tool these are my results. I don’t have any PR goals for the marathon this year. I had aimed for a PR in the New Jersey Marathon but that didn’t pan out. I’m trying to run Philadelphia with my wife and bring us in under 4:30 which I think is doable as we are both sub 2 hour half marathoners and I just want to maintain endurance and health for completing Dopey. Once I have recovered from Dopey next year I can think about another PR race later in the year. I did the time trial to see where my fitness and pace levels were so I am happy with the results. I’m pretty much set on my running gear. I love my Nike UV Miler shirts and also the Road Runner Sports Velocity/Runner’s High shirts and I’m pretty steady with my multiple pairs of Nike shorts. For the long runs I typically go with a compression sleeve (I use Zensah compressions sleeves). I recently saw a discount on Pro Compression Marathon Socks and have seen this brand talked about on plenty of blogs. I purchased a pair this week (in Neon Orange) and decided to take them out for a spin. They were much harder to put on than I expected. They felt a little thinner than my usual sock (I use a medium thickness sock typically) but they felt fine. I ran okay and there was no discomfort from them and my legs were not tired the rest of the day. Interested that I felt the compression around the feet. That is why I tried the full sock over just the sleeve. I want to see how they wash and wear a couple more times before I decide whether to take the plunge and buy a couple of pairs. Anything to help my feet feel less tired during the Dopey will be helpful. Overall, it was a good week. Next week is a little shorter. A step back week where my longest run is 6 miles. Will again aim to cross train on the bike on Monday. Due to a trip I will not be able to run on Sunday so I will run Friday and Saturday and use Sunday as my rest day this week. Not a big deal and it probably will get me used to running all the back to back races at Dopey. 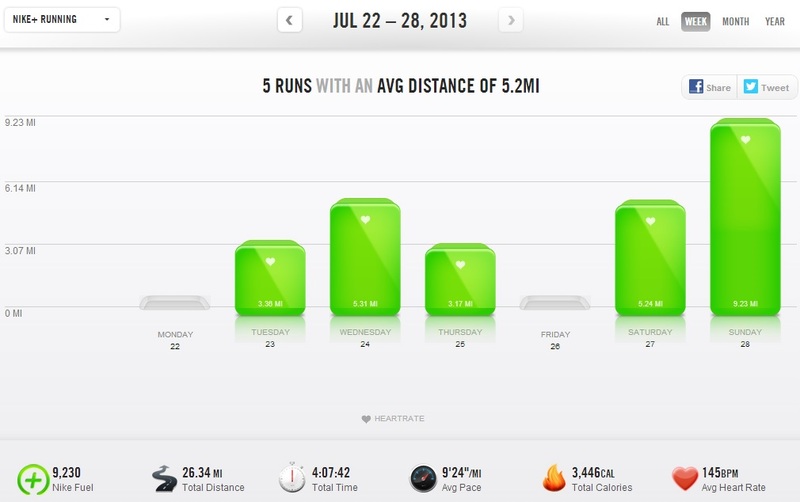 I started my training plan for what will be my 6th and 7th full marathons on Monday. Per Hal Higdon’s plan, Mondays are reserved for cross training and Fridays are reserved for rest days. 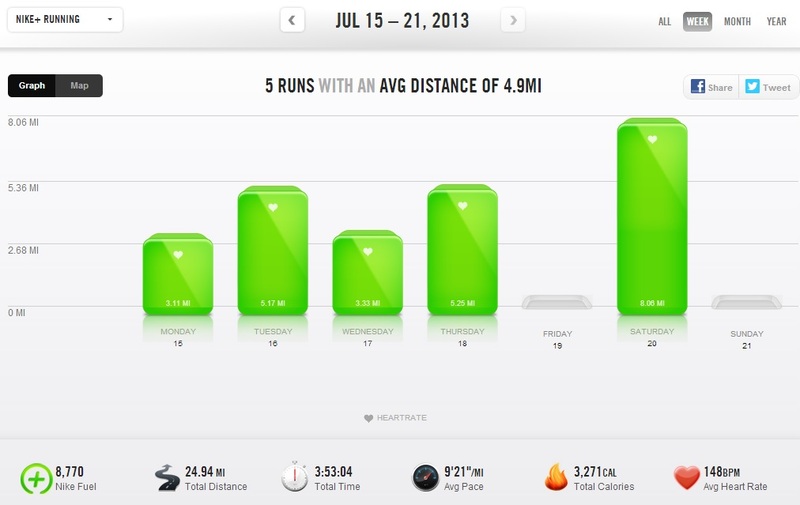 So far, one week in, I got the mileage in but I was kind of off plan already. Due to the logistics of life I was not able to plan my week in line with the plan so somehow I had to get my long run in before Sunday as that was not an option this week. Hal’s plan called for runs on Tuesday (3 miles), Wednesday (5 miles) and Thursday (3 miles) at an easy pace and then 5 easy miles on Saturday and 8 long distance (slow) on Sunday. The heat was a big factor this week. The east coast of the US was under heat advisory for much of the week and it was tough out there. I actually ran on the treadmill for my first day but felt I was being too cautious and took the rest of the runs outside. Tuesday’s run was pretty good. I was getting up early in the morning to beat the heat and made a pretty good pace. You can compare that to Thursday when it was much warmer and at a shorter distance and I was almost a minute per mile slower. In fact I ditched my Friday plan of the long run. I took a days rest after four continuous days running (I’m not at Disney yet). Saturday’s long run was later in the morning and I paid for it with the heat and humidity. I ran out of water at mile 7 and slowed down a little. Overall I felt good this week and feel okay going in to next week. 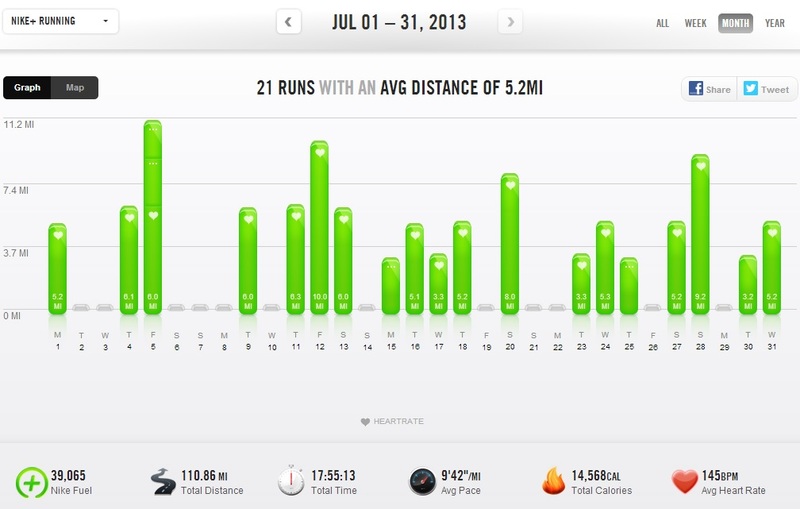 Mileage goes up just one mile for the long run to 9 miles. I was toying around with Galloway intervals this week and went back to his 4:00/0:35 interval that I used for much of last year. I have run the last two months without using the Galloway method, running up to 14 miles without intervals so I know what I am capable of. The goal for Philadelphia is to stay healthy so I can complete the Dopey in January. No PRs for these two events. Following Jeff’s method to stay injury free. Luckily it seems the weather has broken a little and it felt much cooler today. Looking forward to next week and staying closer to the plan. Tomorrow I’m planning on 30 minutes on the stationery bike as my cross training. I also recently bought a stability ball and plan to do some ab work (so I can justify blowing up a big red ball sitting in the corner of the bedroom). I also plan in the next couple of weeks to run a Magic Mile to see where I am on pace overall and to measure against how I was against this time last year. Have a good week. Stay cool and stay healthy. Today I started my training for the 2013 Philadelphia Marathon and the 2014 Walt Disney World ‘Dopey Challenge’. 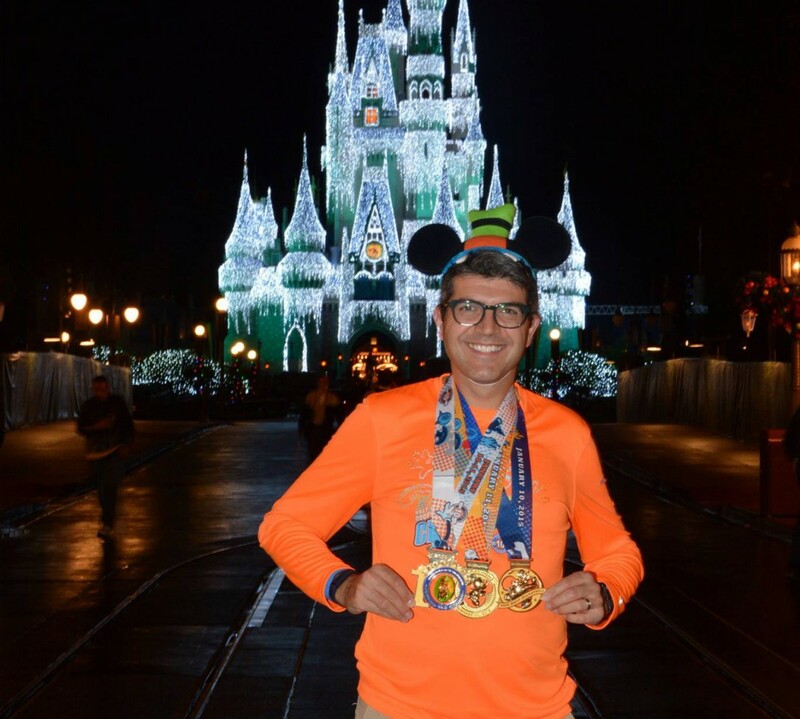 For the next 6 months through the Walt Disney World Marathon Weekend (January 9-12, 2014) I will be out there putting in the miles 5 days a week building my base until race day in Philadelphia (November 17) and then buckling down for the next 8 weeks until ‘Dopey’. As a reminder, the Walt Disney World ‘Dopey Challenge’ is 4 days of running and includes a 5K, 10K, Half Marathon and Full Marathon…truly ‘Dopey’. It’s hard to believe that just 3 years ago I hadn’t run at all. 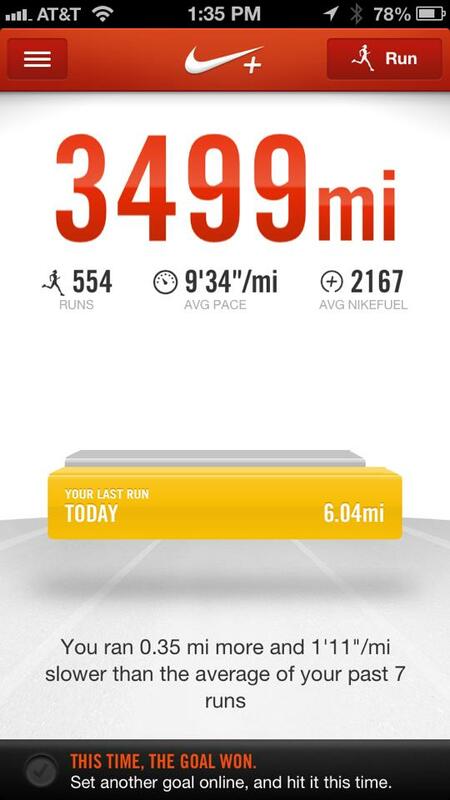 I actually reached 3,500 miles of cumulative running this weekend (since I started recording my mileage in September 2010). 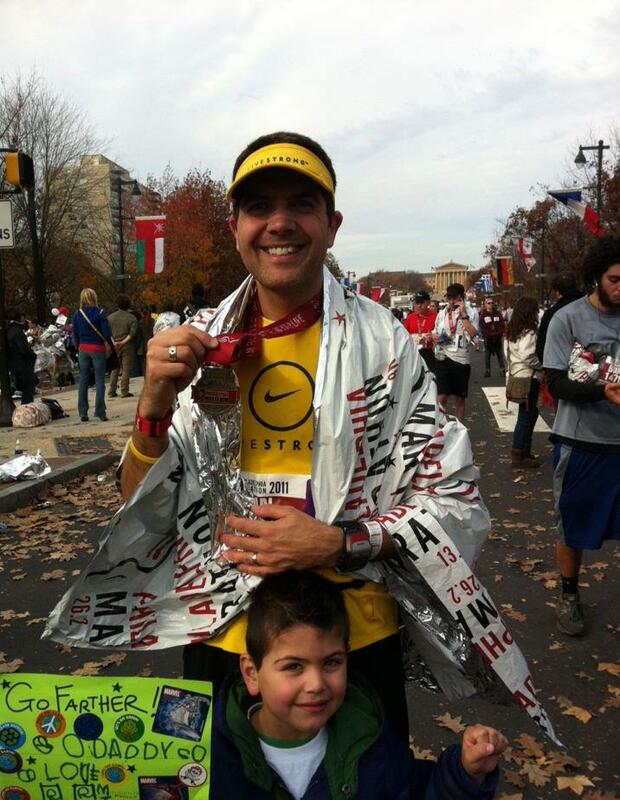 Philadelphia was my first marathon back in 2011 and I was so nervous when I signed up. The feeling of crossing the finish line in my first marathon will always be with me. This year’s Philadelphia Marathon will be my 6th marathon and my third Philadelphia Marathon in a row. I have been in contact with the Philadelphia Marathon folks and may be a featured blogger this year. I’ll share the link if that does happen. I am especially pleased that this year my wife Shari will be running with me for her second marathon. It should be a fun time. The crowds in Philly are really great and there are no real quiet spaces. It’s a great course. The first half takes you through the city, its neighborhoods and many of the well known sights. The second half of the race takes you along Kelly Drive up and back through Manyunk. The finish line is at the foot of the Philadelphia Art Museum (the ‘Rocky’ steps). Temperatures in the last 2 years have been ideal for marathoning. Cool to start and warming up just slightly through the morning but not too hot. 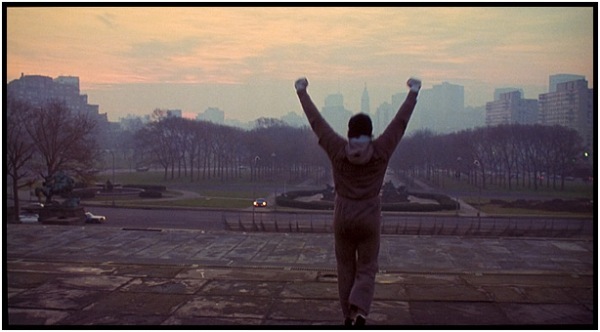 I will then have 8 weeks between running Philadelphia and the Walt Disney Marathon weekend. In 2011 I had only 7 weeks between running Philly and the Walt Disney World Marathon. Having signed up for a second marathon before even finishing my first marathon you can only imagine the thoughts going through my mind if I would be able to do it. I did and even improved on my time from 7 weeks earlier. 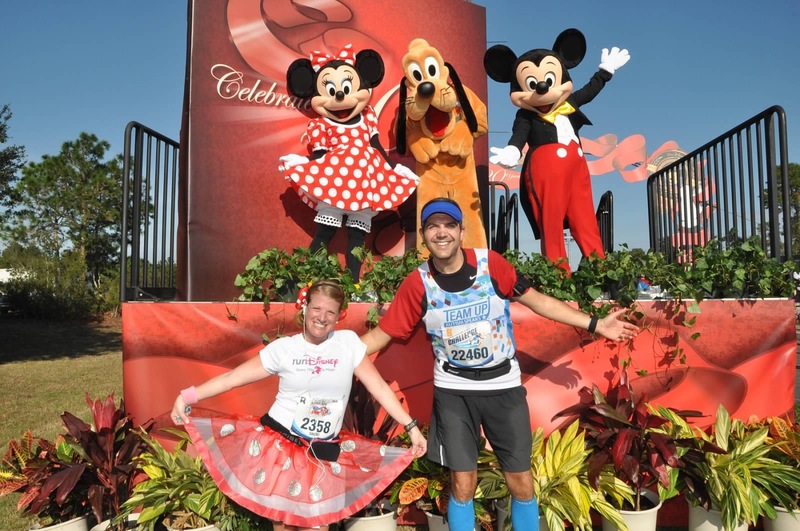 I had been turned on to the idea of the ‘Goofy Challenge’ (running both the Half and Full Marathon) from my experience running alongside the runners during the 2012 Disney Marathon and thought I might be up for the challenge in 2013. I wanted also to return to Philadelphia in 2012 and see if I could improve on my marathon time. 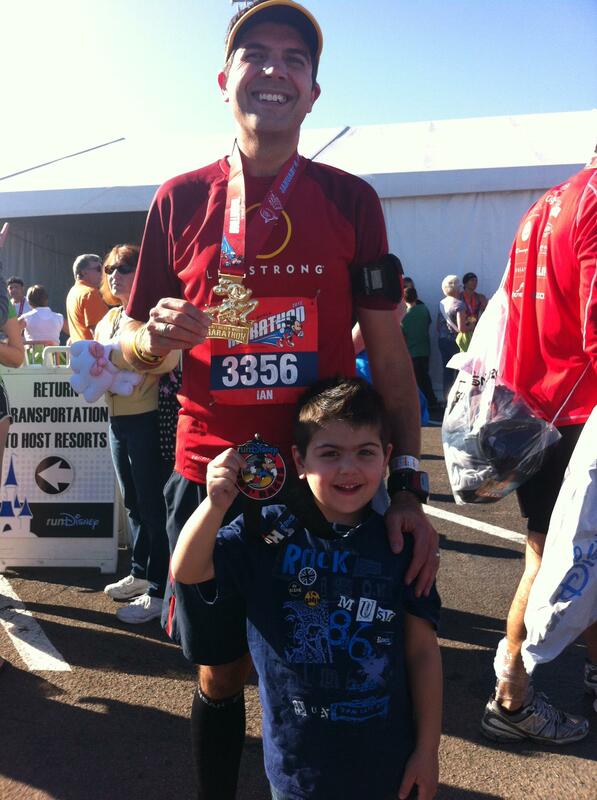 I worked really hard in 2012 and PR’d by over 6 minutes, breaking 4 hours in the marathon. For the ‘Goofy Challenge’ I was running to raise money for ‘Autism Speaks’ and was more concerned with completing the event than of any specific time goal. In addition to the Challenge I also ran the Family 5K with my wife. We also ran the marathon together (her first) and we took as much time as we needed and as many photographs as we could. It was a great weekend. I was able to raise just over $3,400 for Autism Speaks in the process. This year’s Philadelphia Marathon should be special as it is the 20th Anniversary of the race. Philadelphia really knows how to celebrate and I am very much looking forrward to the event this year especially running alongside Shari. They actually moved the Philadelphia Marathon weekend back a week this year as there is another event going on in the city on the usual weekend in November. That will be beneficial for me as it gives me an extra week to train for the ‘Dopey Challenge’. To replicate the race conditions I have modified my race plan to have 4 days of consecutive running from Thursday to Sunday for the last few weeks of the training so my body get used to the effort (or abuse) and it can adapt to recover more effectively. It will also help me know what I need to do in terms of fueling and recovery techniques going into the event. I will be heading to Walt Disney World solo this year due to the logistics of racing all four days. It will be a little different not having the family with me but through the magic of social media I have made lots of great connections with fellow runDisney enthusiasts and will no doubt be meeting up on one or more of these days to share the experience. Don’t feel bad for Shari for not being with me, she is headed down to Walt Disney World the following month to run the 2014 Walt Disney World ‘Princess Half Marathon’ and ‘Glass Slipper Challege’. My training program is here if you are interested in taking a look. This is Hal Higdon‘s Marathon Intermediate 1 marathon plan for (Philly) and his 8 week multiple marathon plan modified so that there are four consecutive running days each Thursday through Sunday. Again this year I will be running for Autism Speaks as a returning alum of ‘Team Up’. They are a great charitable foundation and do wonderful work. I just completed hosting a virtual 5K to raise money for this years event and I am pleased that today it sold out. All 150 spots were taken. You can read about the event here. Everyone seemed to enjoy this event and I have had many kind comments from participants. This has gone a long way in helping me reach my fundraising goals. If you would like to help by sponsoring me as I run ‘Dopey’ please visit my personal fundraising page. Your contributions will be greatly appreciated. I hope you some of you will follow my blog and join me on this journey to the finish line.